Let's talk about under eye circles. If they bother you every time you look in the mirror, you might be wondering how to get rid of them. Hopefully, the below information will put you at ease. You may have been born with the genes for it. If you've had them for as long as you can remember, it could be genetic. You're getting older. Many people start to see dark under eye circles in their 30s, and they can become even more pronounced in the 40s, 50s, and beyond. You've lost a lot of weight quickly. Fat loss occurs all over the body, and that includes under the eyes. This can cause a shallow, dark area where fat used to be. Not wearing enough sunscreen. When you don't wear sunscreen daily, UVA and UVB rays can start to alter skin pigmentation. This is especially common in delicate areas, such as under the eyes. Not seeking allergy treatment. Rubbing your eyes and neglecting the puffiness that comes along with allergy-related irritation can cause under eye discoloration. As you can see, some of the above causes are beyond your control while others are not. You can't do anything about your genetics or getting older. Fortunately, some of the other causes are treatable. There is an easy way to solve this problem: dermal fillers. Many types of dermal fillers can lighten and brighten the skin under the eyes. These injectables can also correct hollowness that usually accompanies dark circles. Additionally, hyaluronic acid, found in the fillers, offers a boost of extended hydration to the area...making it look supple and more youthful. Other fillers are available, but these are the most common ones. 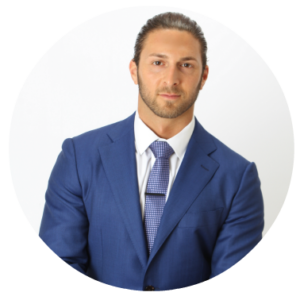 Only an experienced injector, such as James Christian Sardelli, RPA-C can help you decide which formula is best for you. If you're looking to lighten the undereye area and fill in the tear trough areas, contact James Christian Sardelli, RPA-C, for an appointment. His expertise can improve your look with the right fillers placed in just the right areas. Simply call or text his 24/7 Cosmetic Concierge line at 917-860-3113. James Christian Cosmetics proudly serves Suffolk and Nassau Counties including Manhattan, Commack, Islip, West Sayville, Westhampton Beach, Rockville Centre, Farmingdale, and Babylon Village, NY. *Restylane® Silk is a registered trademark of Galderma Laboratories, L.P.
*Juvéderm VOLBELLA® is a trademark of Allergan, Inc.
*Juvéderm Voluma® is a registered trademark of Merz North America, Inc.